Liam McIntyre needed to add lean mass to match his gladiator role. Enter trainer Tyrone Bell, who helped him add 20 pounds of lean muscle. Here’s how. When Liam McIntyre was picked to play Spartacus in War of the Damned, the producers were thrilled with his talent but wary of his physique—at least for this role. To fill the breastplate of a Thracian gladiator-turned-hero, Liam needed more lean mass. I started training Liam in pre-production with an eye toward helping him build Spartacus-worthy size. For six weeks, I put Liam through a grueling, no-holds-barred hypertrophy (i.e., muscle-growth) phase. From there he would move on to a boot camp of fighting and gymnastics, designed to get him up to fight speed. That phase also got him cut, and we had to reboot his hypertrophy phase periodically throughout the season. All told, I helped Liam pack on 25-30 pounds of muscle during our time together. We fit in workouts whenever and wherever we could. Liam was in production constantly, but some scenes finished early, leaving us time for a 30-minute workout. So we developed efficient workouts that allowed us to exploit those small time slots. I'd say the average workout we had was 20 minutes long, so I developed five 19-minute hypertrophy workouts. You have to take on a gladiator mentality to tackle these workouts. I made Liam throw up on himself and he still kept going. When people hear a muscle-building workout only lasts 19 minutes, they say, "Nah, you can't build muscle in that time. It's not enough. It can't be done." The proof is on film. 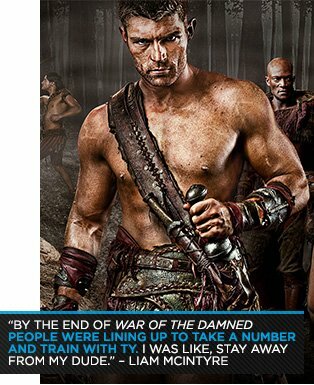 The cast of Spartacus packed on lean mass over time, even under their intense workload. You can, too. If you follow this plan, you'll build shape and size just like the gladiators on Spartacus. 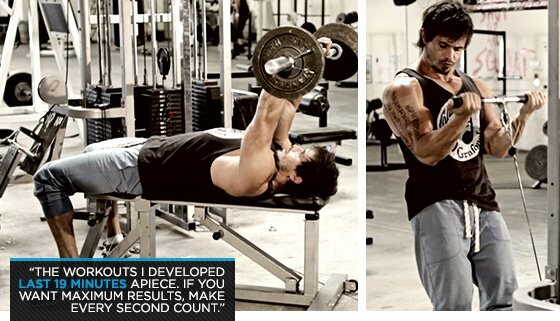 My arms workout is built on three supersets and two stand-alone exercises. The supersets combine compound and detail-oriented isolation exercises, like heavy EZ-bar curls and triceps extensions. The entire workout follows that format until we finish with two exercises that take you to absolute failure. Each superset comprises a biceps and a triceps exercise. As the reps increase and the weight decreases for one exercise, the reps decrease and the weight increases for the next exercise. The reps and load move in opposing directions to deliver maximum grow and a mean arm pump. On the set of War of the Damned, we had only one chance to hit arms each week. Because of the tight production schedule, we had to make every moment count. The workouts I developed last 19 minutes apiece. That's 1,140 seconds to put as much size on Spartacus as possible. If you want maximum results, make every second count and follow my training plan to a "T."
The key principle that carries over into all five of my Spartacus workouts is efficiency. Each workout takes 1,140 seconds. Every second is accounted for with tempo, rest, and transitions between stations. The most important piece of equipment is a stopwatch. The clock starts as soon as you walk in the gym. Your rest periods should be spent adjusting the weights for the next set, or setting up the equipment in the next superset. Use some common sense. Make sure all your exercises are close to each other so you don't waste time running across the gym. Exercise tempo dictates the speed of a full repetition of an exercise, expressed in seconds. Using 3-0-1-0 as an example, the first number indicates that the eccentric, or lowering, part of the lift lasts 3 seconds. The second number indicates that there is no pause at the midpoint of the lift. The third number refers to the concentric, or lifting, portion of the movement—in this case, 1 second. The fourth number indicates whether you should pause at the top of the lift. Most exercises in my Spartacus workouts follow a tempo of 1-0-2-0, which means you lower the weight for 1 second and then lift it for 2 seconds, without a pause. Stick to this tempo through the workouts unless otherwise specified. Check out the full side-by-side interview with Liam McIntyre, star of the STARZ original series, Spartacus: War of the Damned and Tyrone Bell, the hypertrophy trainer who helped him pack on lean muscle for the role of the Thracian gladiator who led a slave army against Roman legions.